My second trip to mainland Europe in as many weeks began with a stupidly alarm clock, followed almost immediately by a realisation that struck with remarkable clarity despite my half-awake state: the music of Lefebure-Wely loses much of its appeal when it begins playing from a phone speaker at 3:50am. My depleted mental capacity made a comprehensive review of recent life choices impossible, though I was lucid enough to decide to retire (again) from early morning flights. 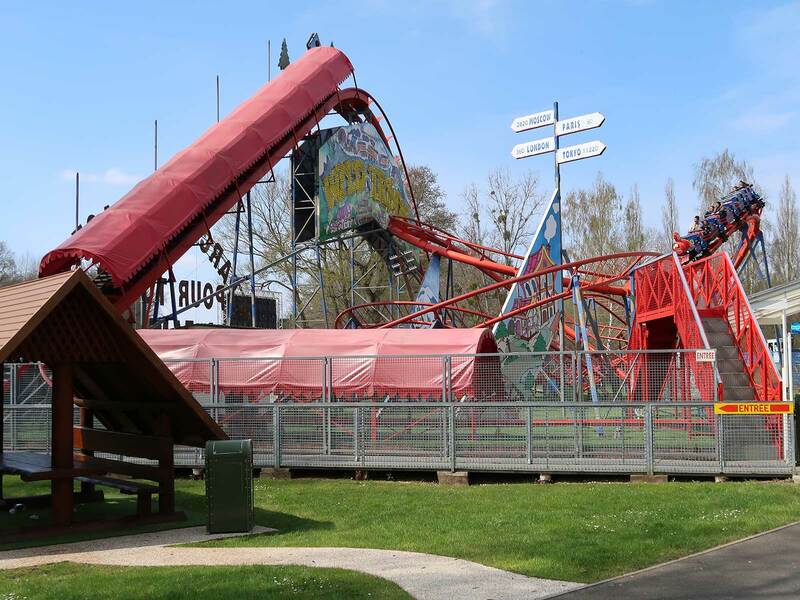 Six hours and one flight later I'd arrived at Le Fleury, a family park located close to the northern tip of France, about forty kilometres from the border with Belgium. The car park was almost completely empty, and for a brief moment I worried that I'd made an embarrassing mistake with opening hours. However I need not have been concerned; there was music playing over the tannoy and around a dozen people waiting to purchase tickets at the entrance. There was no separate queue for online purchases, so I joined the main queue and in due course exchanged ticket serial number 000001 (presumably the first of the year) for a receipt and a park map. Imoogi (#2589) looks at first glance like a Pinfari Z47, but there are a number of subtle differences over the standard models that suggest an alternative provenance. The track has a solid brace on both sides, and the bottom of the first drop has some structural reinforcement that doesn't quite cushion a distinctive crunch as the cars pass over it. The seats have individual lap bars, though this is evidently a recent change as photographs on RCDB from its opening year show a more traditional restraint design. I found that I couldn't get into the front row without crossing my legs, and once in place I had to sit slightly sideways; readers over six feet in height may be better off going for the back. For all that, the only real oddity with the ride was the dispatch procedure, which involved rolling the car perhaps a metre back from the station exit and giving it a running push towards the base of the lift. I decided to do a courtesy ride on L'Epee d'Odin, a SBF tower, but it wasn't to be due to a technical problem. The operator made a number of attempts to cycle the restraints, but eventually gave up after a rather unhappy beeping noise began to emanate from the control panel. I responded to the apologetic gallic shrug and a revenez plus tard with the best Franglais I could master; quand vous achetez un nouveau montagne russe. On my way to the exit I walked past the site for the new-for-2019 additions of Le marteau de Thor and Les chopes d'Egill, a Frisbee and set of Tea Cups respectively; there was nothing to see except concrete pads, indicating that the park has some work to do if they are to open as scheduled when summer pricing starts on June 21. The first thing anyone notices on arrival at Parc Saint Paul is the security staff at the main entrance. Messieurs Brahim Takioullah (2.46m, 8'1"), Arshavir Grigoryan (2.34m, 7'7"), and Abdramane Dembele (2.32m, 7'7") present a dramatic appearance that cannot but give would-be malefactors pause. One can only imagine how difficult it must be for these gentlemen to find clothes (and shoes) that fit. I had planned to start my visit with redemption laps on the wooden coaster, but it was closed due to a technical problem. Rather than hang around I headed for the Pax Wild Train, restored to operation this year after being HNFT for the entire 2018 season. The newly rebuilt rolling stock features separate lap bars for each seat in place of the shared restraint of times past, which allows smaller children to be properly secured when sitting next to their parents. That said, there is no interlock system; the train was able to dispatch with the restraint in the empty seat next to me wide open. The ride experience remains very good, even if the tracking is no longer quite as smooth as it was when I first rode almost fifteen years ago; there is respectable airtime to be had, particularly towards the back of the train. After a few laps I decided to relocate to the back of the park, where I was just in time to see a test train ascending the lift hill for Wood Express (#2590). The dispatch apparently passed muster, as moments later a member of staff materialised at the entrance to unlock the gate. The queue routed through the middle of the layout then took a left turn onto a path with the lift hill on one side and a plain fence on the other. The spartan appearance felt out of place in an otherwise elegant park; a few posters showing the history of the wooden coaster over the years, as at Gröna Lund, would have been a simple way to make the space look much better. The €3 million ride has been supplied with a single twelve passenger Timberliner train that in theory at least can handle 372 passengers an hour, though this estimate is based on a thirty second unload/load/dispatch cycle that is unlikely to be achieved all that often in day-to-day operations. Today's figure was closer to 240 passengers per hour, though in fairness to the lone operator this was all that was needed as the wait time never exceeded five minutes. The designers have allowed for the possibility that a second train might be needed at some stage, as the brake run is long enough to be converted into a block section. The layout begins with a tight ninety degree turn followed by a chain lift, which takes just twelve seconds to bring the train to the fifteen metre apex. 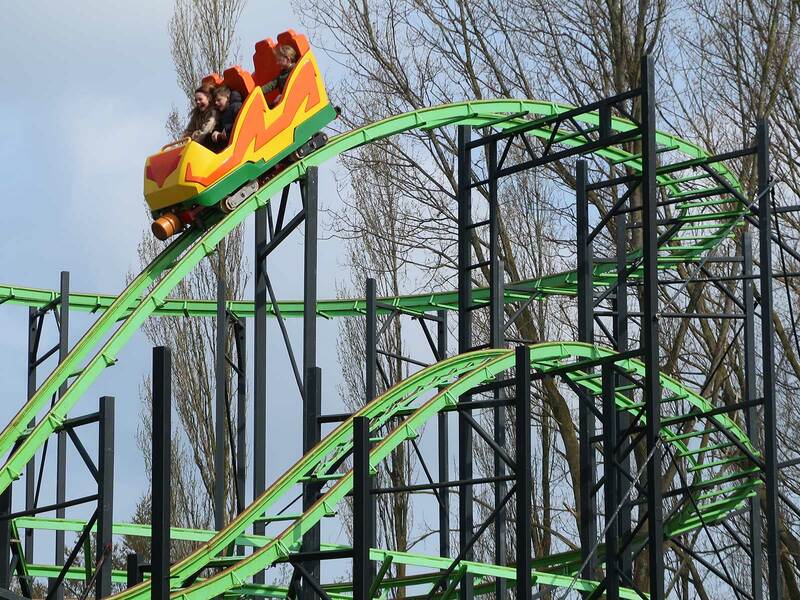 The first drop is taken at a 57° angle, and leads almost immediately to the first of twelve airtime hills, each of which delivers a gentle float at both ends of the train. The route also features three 180° turns and two sideways movements that are handled effortlessly. The comfort level is flawless, and the stop at the end of the ride is handled gently, a marked upgrade over Roar-O-Saurus. The ride is a winner; I managed six laps over the course of an hour and would happily have done more. My next stop was in the Arche Aux Spectacles, a performance tent that today featured Apache Le Roi Lion et ses 9 Lionnes, a show featuring ten lions climbing up on things and posing in groups. 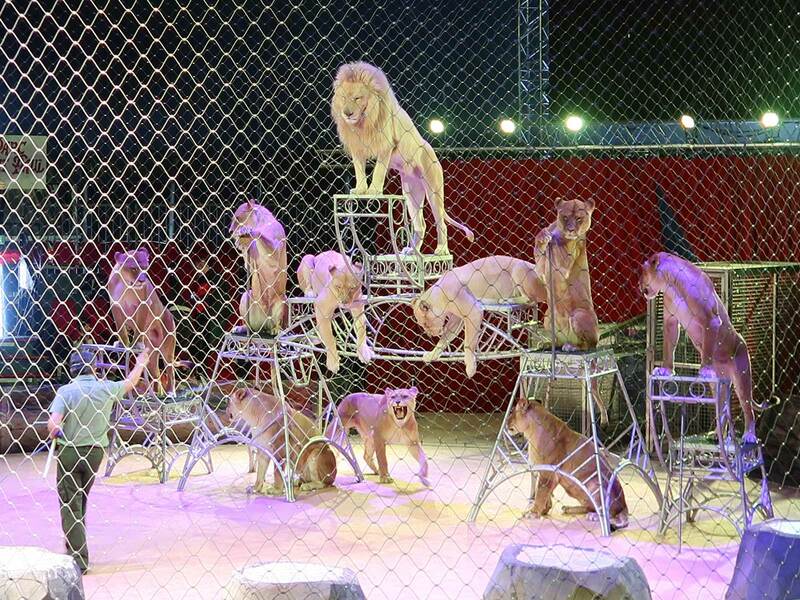 Though animal shows are generally not my thing this one was truly amazing to behold, especially when nine of the creatures stood together on their hind legs while a tenth jumped overhead. As if that were not enough, two members of the audience were brought into the arena at different points in the performance to dance as the lions ran rings around them. The presenter did a superb job of disguising the obvious danger from the predators, though I did spot two members of staff standing next to the entrance with tranquillizer guns ready to go; with luck they will never be needed. I had about an hour left to play with by the time the show came to an end. Much of it was spent on a slow walk through the Chateau Hanté, followed by courtesy circuits on Aérotrain and Formule 1. The queue for Souris Verte looked like more trouble than it was worth; after brief contemplation I decided against joining it in favour of a more relaxed dinner at the airport.